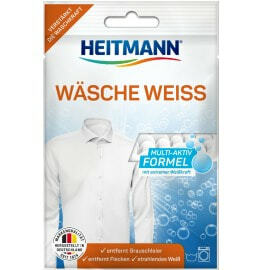 Extreme white without any bleach: the liquid HEITMANN Laundry White dissolves immediately during the wash cycle and unfolds its extreme whitening power. You can thus eliminate greying and yellowing even from delicate laundry. HEITMANN Laundry White liquid was specifically formulated for liquid detergents. This ensures that nothing sticks or clumps together. Laundry White dissolves immediately and releases its extreme whitening power. Your greyed or yellowed white laundry will be radiantly white again. HEITMANN Laundry White is suitable for all washing temperatures and fibres, even for delicates. For up to twelve applications. A particularly bright white, even for delicate laundry: with HEITMANN Laundry White liquid, your laundry will radiate in extreme white—without any bleach. Depending on the machine load, add one to a maximum of two capfuls in the detergent compartment. out the detergent as usual. Then start the main wash cycle without pre-wash. Follow the dosage instructions on the bottle.